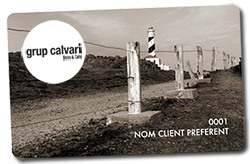 Our restaurant Café del Calvari has both magnificent location and an excellent menu. On the foot of the Calvari, enjoy eating in Pollensa on our terrace on any of the 300 days of sun that the beautiful island of Mallorca gives us. If you wish to eat in Pollensa, take a look at our varied menu. Tapas such as our delicious homemade meatballs, squid rings or garlic mushrooms. Snacks. Try our delicious Spanish omelette with salad or our BBQ ribs with chips. A sandwich? For sure that the Mallorca, of cheese and sobrassada, or the Calvari Club with chicken, lettuce, tomato, egg, cheese and mayonnaise accompanied by chips, will make you want to lick your fingers. Pa amb oli. 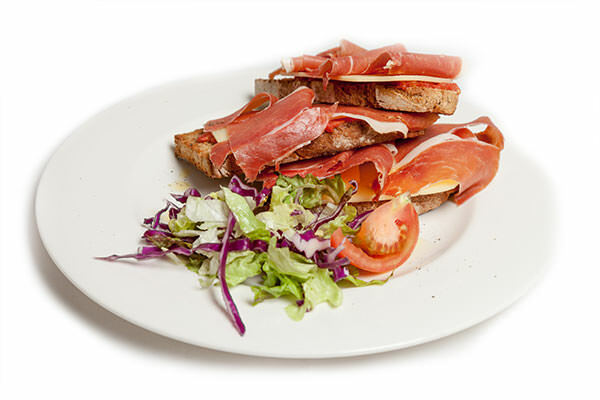 To Try something typically Mallorcan like no other, you will find delicious “pa amb oli”, all made with daily fresh rustic bread, quality virgin olive oil and fresh tomatoes. Some of our delicious options are bread accompanied by “Mahon cheese”, grilled vegetables or a mythical “Iberian table of cured meats”. If you wish to have a more classical baguette, we also have some very enjoyable ones. A “Spanish” one, made with Spanish omelette, lettuce and tomato, or a Calvari Club of chicken, lettuce, tomato, mayonnaise and egg are both triumphant in our restaurant. Our salads are perfect if you are looking to enjoy something light. For sure that if youTry our “trampó” or the Calvari salad you’ll be surprised at howmuch flavour and texture can be hidden in such healthy dishes! And finally our pastas. Who doesn’t love pasta? Our spaghetti Bolognese, Carbonara tagliatelli or beef lasagnes. Give them a Try! 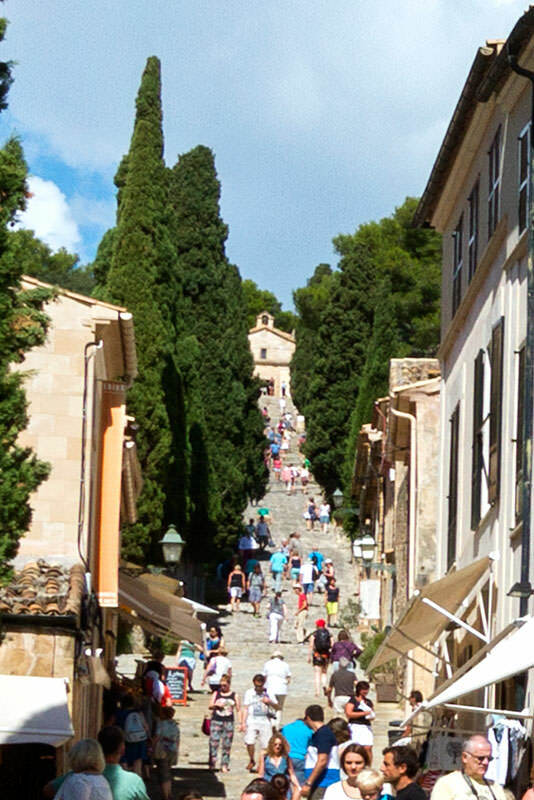 The Calvari consists of 365 steps, one for every day of the year, which lead up to a small church which is at the top of the hill. It is one of the most emblematic places of Pollensa, both for its ancientness and for the tradition hidden behindit, all Pollensans feel it’s a part of them. The small church was built at the end of the 18th century and its steps were built between the 19th Centuri and the beginning of the 20th century. The first residents on the hill were templaries, and today we still celebrate the fall of the Cross of Jesus Christ at Easter. On this same hill you will also fins the three crosses of the viacrucis, which are centenary. From the highest point you can observe spectacular views of Pollensa, and also see part of Sa Pobla and Port of Pollensa. You really want to visit this beautiful place, don’t you? That’s precisely why we wish to be at the foot of it, so it can be much easier for you to get strength before you go up the stairs, or to be able to relax when you come back down them. So now you know, if you wish to mix visiting with pleasure, don’t hesitate to visit the Calvari and discover what eating in Pollensa is like. Where to find our restaurant in Pollensa.